Sara Brand-New, organizer of Knit-Maine-ia, asked Belfast city councilors Tuesday night to allow her group to rent the Belfast Boathouse for free for a charity event in October. BELFAST, Maine — Belfast’s increasing popularity means that city officials are grappling with issues relating to higher traffic volumes and bigger demands on infrastructure. Belfast city councilors decided at Tuesday night’s regular council meeting that they would address one of those problems — complaints about long waits at the intersection of Main and High streets downtown — by doing a controlled test. During this test, councilors agreed, the Police Department will switch the traffic light to a four-way blinking red light, and officers will monitor how drivers manage without the green lights. But not all councilors agreed that the downtown intersection is really an issue that needs to be addressed. However, the majority of councilors were in favor of running the test, which Councilor Mary Mortier requested occur at a busy traffic time, such as a summertime Friday afternoon. In other business, councilors also addressed a request by a charity event organizer to have no fee to use the Belfast Boathouse on Saturday, Oct. 3. The event, the Knit-Maine-ia Fashion Show organized by Sara Brand-New and Jillian Liversidge, donates all proceeds to New Hope For Women, the midcoast domestic violence prevention agency. The women expect to generate about $800 for the nonprofit organization and last year paid $200 to use the boathouse for the day, which, according to City Manager Joe Slocum, now has a rental rate of $1,600 for the weekend for residents and $2,300 for nonresidents. It also can be rented by the day. “Every other weekend in October this year is booked for a wedding,” Slocum wrote in his manager’s report, adding that Knit-Maine-ia negotiated a reduced fee of $350 with the rental manager for the boathouse. 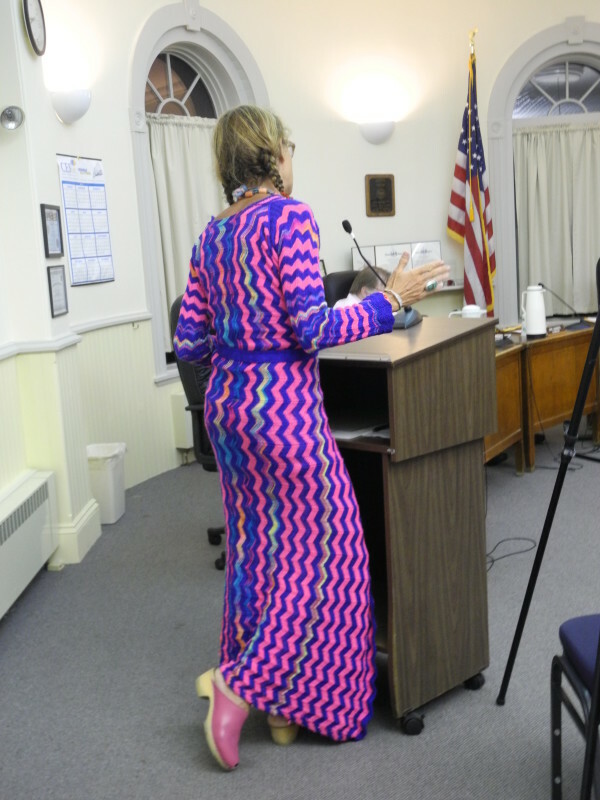 Councilor Mike Hurley told Brand-New, who was wearing a floor-length hand-knitted wrap dress to the meeting, that the city officials had just decided after this year’s budget session not to do reduced rates anymore. Councilor Eric Sanders said that city officials have not often followed their own protocol regarding boathouse rentals. In the end, the council decided to amend the rental fee for the event to $200. Brand-New said after the vote that she appreciated the council’s willingness to work with her. — Voted to enter into a contract with IGS Generation to install and operate solar panels at the former city landfill on Pitcher Road. — Decided to make part-time Officer Lewis Dyer a full-time patrol officer in anticipation of Officer Wendell Ward’s retirement after 30 years in law enforcement in the city. — Sold a small piece of land behind Rollie’s Tavern to business owner Ryan Otis for $15,000. — Authorized city employees to request free signs from the Maine Department of Transportation to remind motorists to allow a minimum of 3 feet to pass bicycles or pedestrians. The signs will be put at locations around the city.